Movies such as Let's Be Cops live or die by the chemistry of the two leading actors and there is no debate that Jake Johnson and Damon Wayans Jr. like being around one another. Throughout the entirety of this feature they look like they had some serious fun making this movie together, but only so much of that comes through in the final product. As the saying goes: if the film were half as fun to watch as they seemed to have making it we might have been in for something that rivaled the recent success of the Jump Street series, but it doesn't. What this actually feels like while watching it is just a large amount of incompetence. It has a lazily constructed plot centered around an incohesive way of telling its story with even lazier comedy that comes purely from the improvisations and tones in which Johnson and Wayans deliver their dialogue and gyrate their bodies. If we really want to break it down though, Let's Be Cops is about as sub-par in the buddy cop genre as one can get. With both of the Jump Street movies there is the hook of the boys going undercover at high school and college which is always interesting (they try to do that here with the gimmick of not actually being cops, but again, it just seems more idiotic than funny), in Bad Boys there is a real sense of responsibility and peril to go along with the palpable chemistry (not to mention the pure R-rated Bayhem of the second one) and the same could be said for any of the Lethal Weapons. The pairing of personas such as Mel Gibson and Danny Glover was a hook in itself, but putting them in a legit action movie with character at the forefront only meant better results than expected. Let's Be Cops is a comedy though and one that wants to play on the archetypes of the aforementioned films while riding the coat tails of the Jump Street movies in hopes they too take off. Why they couldn't have found a different premise to execute the chumminess of Johnson and Wayans over, I don't know, but as it is I can only hope we don't get any sequels to this steaming mess of a movie. 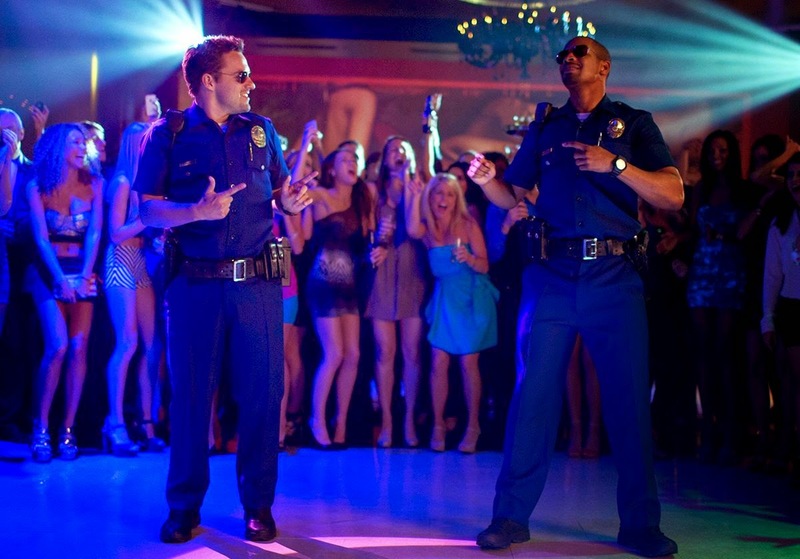 Ryan (Jake Johnson) and Justin (Damon Wayans Jr.) dance it out in Let's Be Cops. Let's get this much straight at least-the premise for this movie is stupid. There is no way two guys who presumably graduated from Purdue are dumb enough to think there aren't going to be some major consequences for impersonating a police officer. It could have been funny if the characters here knew how far and where to take their schtick, but even they become so wrapped up in the fact they think they're real cops that it gets to the point of using zero brain functionality. We meet Ryan (Johnson) and Justin (Wayans) as one performs karaoke (ripping from another comedy that made a particular song notable again last year) while the other looks on embarrassingly. As they leave the restaurant their car is hit by a suspicious, tinted-out black Mercedes that drives off with nothing but glaring stares for Ryan and Justin. Ryan is a former college football star who never made anything of himself other than starring in a herpes commercial that he has somehow managed to live off of for months on end and Justin works a dead end job at a video game company where he'd like to become a developer, but doesn't have the nerve to stand up for himself. After coming to terms with their failures at a college reunion/masquerade party where they mistakenly dress as cops they are on the verge of moving back to their home state of Ohio. That is, of course, until people on the street begin to stare and take notice of them as if they were actually enforcers of the law. They begin to test the limits of their powers and soon enough take such drastic measures as to act out an interrogation of the same guys who hit Ryan's car a few nights back as they suspiciously hang out at the same restaurant as before, where Justin's secret crush, Josie (Nina Doberv), works. Naturally, these guys are thugs for a bigger boss (James D'Arcy) who is looking to take over a string of small restaurants for his own, illegal purposes and who has his own intentions with Josie. You may can guess that these fake cops get pulled into this web of crime and you can also bet they go full tilt with the cop thing rather than just reporting it to the real cops. It's a comedy though, right? Let's forgive all the illogical aspects of the story and the idiocy of the characters as long as we're laughing, right? Maybe, but more often than not we're just waiting for something genuinely funny to happen. Don't get me wrong, there are a few moments where I laughed without feeling the movie was forcing me to, but those moments are too far and few between the drudge of trying. There is an instance where our two leads take a text conversation and read it as if it were a play, assigning each other parts which they of course take on as roles and give a performance through that is genuinely funny. The appearance of Keegan-Michael Key as Pupa, a dread-locked driver for D'Arcy who transports his secret product is good for a few laughs before he disappears completely, but other than these limited examples we are left only hoping for more Rob Riggle. Riggle, who has now played a cop God knows how many times sticks to his typically brash and intimidating self, but unlike the leads actually owns the movie (or at least the parts he's in) as if it were him headlining the thing and really, he probably should be. Again, don't get me wrong, Johnson is giving this thing his all trying to make it work, but at some point we all have to admit it's not as funny watching others laugh at themselves as us simply laughing at them. Johnson laughs at himself a lot in this movie and his "vibage" can be contagious, but when we aren't laughing at what he finds so hilarious we find the movie more grating than anything. I haven't seen Wayans in Happy Endings or the most recent season of New Girl, but here the guy is just awkward. I know it's likely the case of no one being able to tell the son of Major Payne he's not a very good actor, but only when he plays toward the outlandish or becomes another character is his performance not embarrassing. You'll notice in the opening paragraph I said that our two leads like being around one another, but I never admitted to thinking they had good chemistry. This is the biggest downfall of the film. You can't have a buddy cop film where the buddy's don't gel and despite Johnson and Wayans clearly being friends in real life Wayans performance is so stilted when he has to be a version of himself that it doesn't translate to the screen at all. Justin and Ryan try their version of waterboarding on perp Pupa (Keegan-Michael Key). 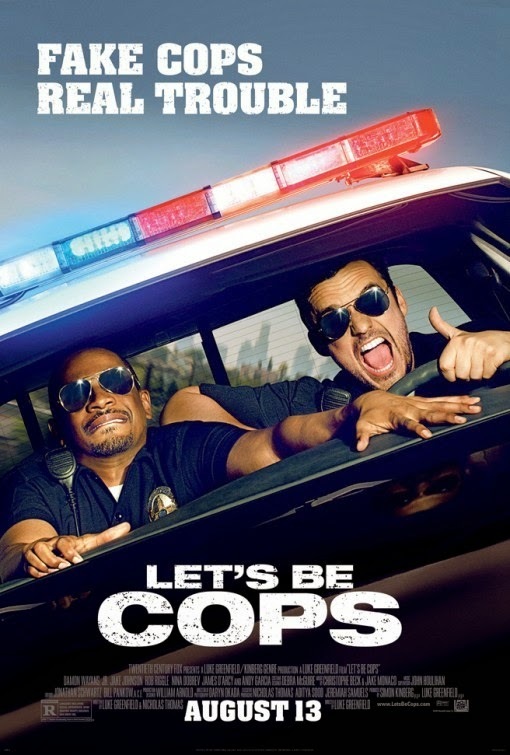 The final result of what Let's Be Cops is though is the result of the amount of effort the makers, including the writers, director, action coordinators and art designers (moreso than the actors even) put into it which doesn't seem like very much.The set design especially feels extremely lazy and typical and the writing consists of thinking that thoughts such as, "follow your dreams or you''ll regret it for the rest of your life," are insightful. Directed by Luke Greenfield (The Girl Next Door, Something Borrowed) this is a movie slapped together with confusing editing (wait? there was a lapse of time between looking at ebay and getting the car? ), a barrage of montages where our protagonists use their authority to do such things as get the front seat on a roller coaster and imitate strippers as well as overly-relying on its mixed bag of a soundtrack to emphasize the intended emotional resonance and to let us know when we should be having fun. Then there is the random voice-over at the end from Wayans' Justin that literally comes out of nowhere and at which point I'd already given up on trying to make any sense out of this disjointed wreck. One would think that with such a strong comedic cast and a somewhat funny premise that something good could possibly come of this, but there is just no way of overcoming the amount of obstacles that are stacked against them here. There is a moment in the third act, what technically might be considered the climax of the film where it almost seems to want to redeem itself with some introspective filmmaking and writing that takes a look at violence and the difference in experiencing it through entertainment and actually being in the line of fire. It was clear there was a thought behind it, some kind of initiative taken in designing the shots and the overlapping themes of the dialogue being read at the same time that made the film feel more substantial than it had even aspired to be up to this point. It is a shame this moment is as brief as it is though leaving us with what is mostly an exercise in pointlessness.